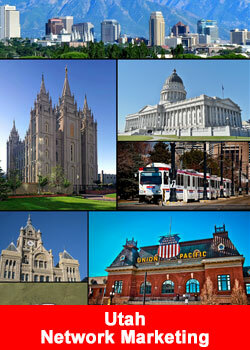 Utah in the USA and its capital Salt Lake City is famous for its world-class ski resorts, nature and the Church of Jesus Christ of Latter-day Saints (LDS Church). Beyond that, however, Utah has a lesser-known claim to fame: It is the unofficial world capital of multi-level marketing and direct sales companies. There are at least 100 Network Marketing companies in Utah alone, generating est $8.5 + Billion in annual revenue and making direct sales the second-biggest industry in Utah behind tourism, according to Loren Israelsen, executive director of the Utah-based United Natural Products Alliance. Under corporate executives there is a strong “Old Boys network culture” many executives have worked with each other in different companies, helping each other to success. Top earners such as Ken and Carol Porter with life time earnings of $28 million, Steve and Melyn Campbell $26 Million, Nathan Ricks $50 million and Mark Comer $17 Million are Utah based residents. Per capita, Utah has more MLMs than any other state.“It must have something to do with the way LDS culture works in the valley,” said Ann Dalton, CEO of the beauty product direct-seller Perfectly Posh, from her Salt Lake City office. Connections fostered in LDS communities, said Dalton, create a hotbed for businesses with a social sharing model. The prevalence of national and international missions by young men and women for the LDS church, she speculates, plays a huge role. Kirk Jowers, VP of corporate relations and European markets at doTERRA, agrees. “It would be very difficult for doTERRA to experience the success it’s had in any other state,” Jowers said of the essential oils company, which boasts more than 50,000 doTERRA consultants, or “wellness advocates,” in Utah alone. For Alyx Garner, Lipsense lipstick consultant and mother of two, the prevalence of MLMs in Utah is about more than an educated Mormon sales force. “There’s so much pressure in LDS culture to be a stay-at-home mom,” said Garner, a devout Mormon who took up direct sales while raising her children. The numbers back up Garner’s claim: Utah has one of the highest concentration of stay-at-home mothers in the country, according to a national study by the New York Times, which estimates 46 percent of prime-age women in Provo are not working, while 8 percent of men are not. Garner estimates about 75 percent of Utah women she knows are involved in direct sales, some because they want to stay in the workforce and others because they want to contribute to household income. These women, Garner said, turned to direct sales companies as a way to bring in money and still work around motherhood’s demanding schedule. Garner has eight sellers in her “downline.” For those who don’t speak MLM, that means she has eight people she personally recruited to sell products underneath her, earning her a small commission from their sales. Last month, she made about $1,000 in profit from personal sales and an additional $250 in commission from downline sellers. “Women are starting businesses more and more,” Dalton said. Utah based Companies in the Business For Home database with 2015 revenue, $1 million means “not available”.